Hey babes! Recently I was contacted by Yoins, a popular shopping site filled with clothes which fit just about every style and budget! While scrolling through their items, as I usually do when I'm out of TV shows to watch, I stumbled upon so many cute pieces, so I decided to share a few with you here. In case you like the items that I've shared with you and want to buy something from their website, don't forget that Black Friday & Cyber Monday are coming soon, so you can these amazing pieces at an even lower price! Oh, and you can also get a surprise gift! Something that I love wearing during autumn is blouses, because not only do they look cute, but they are perfect to wear during fall because you can easily just put a blazer or a cardigan over it, and voila - you have a cosy and warm outfit! Luckily, they offer a great variety of fashionable blouses for women and here are some, they are just effortlessly cute! Yes, they are all white, but you that's how I like them haha. They are so easy to style during these cold days, but even easier during the summer when you can just throw them on a mini skirt, add some sandals or cool shoes, accessories, a cute bag, and you're ready for your summer stroll around the city! 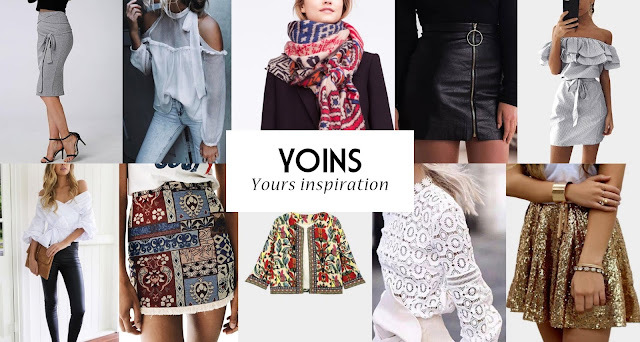 If this didn't inspire you enough, check out Yoins' tips on how to style them, some of the looks are so pretty! They also have a super cute blog, so feel free scroll a bit and inform yourself on many styles and tips they have to share! Yoins is so amazing for whatever you are looking for, and I am already putting together my own wishlist. I don't know about you guys, but I fell in love with the boho skirt up here, such a cute accent piece! So yeah, make sure you check out Yoins, you might even find that perfect present for your friend that you've been looking for! And let me know if you buy something, can't wait to see what you guys like to shop for!